The mega-fight between Canelo Alvarez and Gennady Golovkin next month is officially off, with the Mexican superstar sensationally withdrawing from the contest two months after twice testing positive for the banned substance clenbuterol. 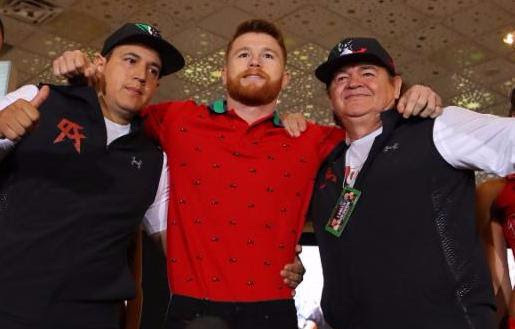 “I have always been a clean fighter and I always will be a clean fighter,” Alvarez told the media on Tuesday during a conference call. “I want to prove without a doubt that I have never intentionally ingested clenbuterol. The May 5 fight at the T-Mobile Arena in Las Vegas, Nevada was to be a rematch of their fight at the same venue last September that ended in a hotly disputed draw. On March 5 Alvarez’s promoter Golden Boy Promotions released details of the failed drug tests from February that they blamed on contaminated Mexican beef. The Nevada State Athletic Commission (NSAC) temporarily suspended Alvarez and scheduled a meeting on April 10 to determine his fate. It was anticipated that Alvarez would face a suspension of between six months and a year. Alvarez’s withdrawal leaves undisputed middleweight champion Golovkin without a dance partner for May 5, but there has been no shortage of boxers lining up to step in and fill the void. These range from the known to the unknown and include Billy Joe Saunders, Gary “Spike” Sullivan, Julio Cesar Chavez Jr, Yamaguchi Falcao, Demetrius Andrade, Sergiy Derevyanchenko and more.